As you can see, as each key physical gold trading/delivery market closes, the price of gold is taken lower. 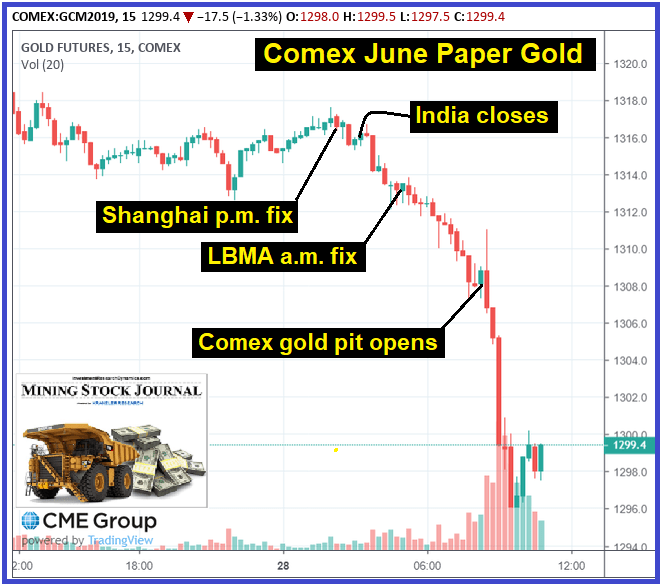 The coup de grâce occurs when the Comex gold pit opens. The Comex is a pure paper market, as very little physical gold is ever removed from the vaults and the paper derivative open interest far exceeds the amount gold that is reported to be held in the Comex vaults (note: the warehouse reports compiled by the banks that control the Comex are never independently audited). Today, technically, is first notice day for April gold contracts despite March 29th as the official designation. Any account with a long position that does not intend to take delivery naturally sells its long position in April contracts. Any account not funded to accommodate a delivery is liquidated by 5 p.m. the day before first notice. This dynamic contributes to the ease with which a paper raid on the gold price can be successfully implemented. Image credit: The Daily Coin.